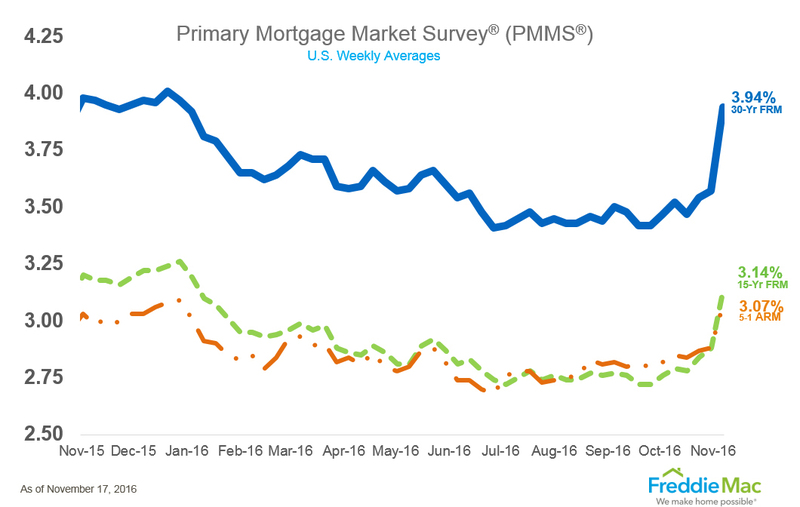 Sean Becketti, chief economist of Freddie Mac said, "Last week's election fell in the middle of our survey week, making it impossible to determine how closely the mortgage rate would track the post-election sell-off in the Treasury market. This week, the verdict is in -- over the last two weeks the 30-year mortgage rate jumped 40 basis points to 3.94 percent, almost identical to the 39 basis point increase in the 10-year Treasury yield. If rates stick at these levels, expect a final burst of home sales and refinances as 'fence sitters' try to beat further increases, then a marked slowdown in housing activity." 30-year fixed-rate mortgage (FRM) averaged 3.94 percent with an average 0.5 point for the week ending November 17, 2016, up from last week when it averaged 3.57 percent. A year ago at this time, the 30-year FRM averaged 3.97 percent. 15-year FRM this week averaged 3.14 percent with an average 0.5 point, up from last week when it averaged 2.88 percent. A year ago at this time, the 15-year FRM averaged 3.18 percent. 5-year Treasury-indexed hybrid adjustable-rate mortgage (ARM) averaged 3.07 percent this week with an average 0.4 point, up from last week when it averaged 2.88 percent. A year ago, the 5-year ARM averaged 2.98 percent.